Transistors, those tiny electrical switches that process signals and data, are the brain power behind every electronic device – from laptops and smartphones to your digital thermostat. As they continue to shrink in size, computers have become smaller, more powerful, and more pervasive. However, as we look to build squishy, human-friendly machines that have the look and feel of soft natural organisms, we need to look beyond the rigid materials used to create electrical switches and circuits. Mechanical engineers Carmel Majidi and James Wissman of the Soft Machines Lab at Carnegie Mellon University have been looking at new ways to create electronics that are not just digitally functional but also soft and deformable. Rather than making circuits from rigid metals like copper or silver, they use a special metal alloy that is liquid at room temperature. This alloy, made by mixing indium and gallium, is a non-toxic alternative to mercury and can be infused in rubber to make circuits that are as soft and elastic as natural skin. Teaming up with Michael Dickey at North Carolina State University, they recently discovered that liquid metal electronics are not only useful for stretchable circuit wiring but can also be used to make electrical switches. These fluidic transistors work by opening and closing the connection between two liquid metal droplets. When a voltage drop is applied in one direction, the droplets move towards each other and coalesce to form a metallic bridge for conducting electricity. When voltage is applied in a different direction, the droplets spontaneously break apart and turn the switch to open. By quickly alternating between an open and closed and open switch state with only a small amount of voltage, the researchers were able to mimic the properties of a conventional transistor. The team came to this result by exploiting a capillary instability. "We see capillary instabilities all the time," says Majidi. "If you turn on a faucet and the flow rate is really low, sometimes you'll see this transition from a steady stream to individual droplets. That's called a Rayleigh instability." 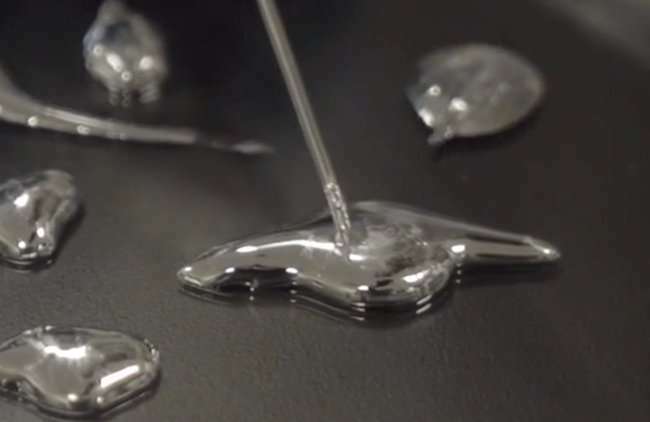 The researchers had to find a way to induce this instability in the liquid metal such that it could seamlessly transition from one droplet to two. After performing a series of tests on droplets within a sodium hydroxide bath, they realized that the instability was driven by the coupling between an applied voltage and an electro-chemical reaction. This coupling caused a gradient in the droplet's surface oxidation, which then resulted in a gradient in the droplet's surface tension, which finally drove the separation of the two droplets. The team calls it a liquid metal transistor because it has the same kind of circuit properties found in a conventional circuit transistor. "We have these two droplets that are analogous to source and drain electrodes in a field-effect transistor, and we can use this shape programmable effect to open and close the circuit," says Majidi. "You could eventually use this effect to create these physically reconfigurable circuits." The applications for this type of programmable matter are endless. If materials can be programmed to change shape, they can potentially change their function depending on their configuration, or even reconfigure themselves to bypass damage in extreme environments. "It could be on a structure that's undergoing some very large physical deformations, like a flying robot that mimics the properties of a bird," says Majidi. "When it spreads its wings, you want the circuitry on the wings to also deform and reconfigure so that they remain operational or support some new kind of electrical functionality." Other applications could include liquid computers for uses in technologies of the future. Think of miniature computers that interface with biological material to monitor disease in the body or restore brain function to a stroke survivor. Imagine search and rescue robots that can self-assemble new parts when damaged. Although it sounds like science fiction, liquid computing might one day be as commonplace as today's laptops. Wissman, Dickey, and Majidi summarized their research in a paper published in the journal Advanced Science.